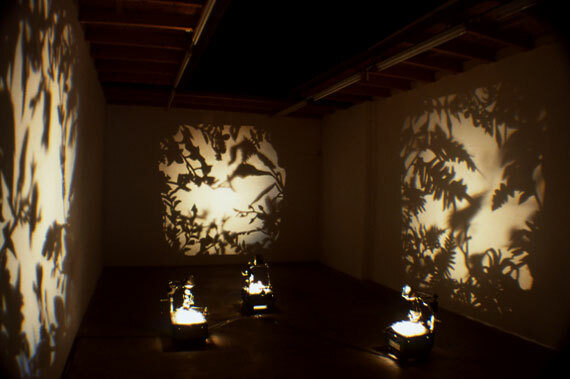 In the installation: "Garden of Delight" the screens of three overhead projectors are covered with pieces of newspaper. Some headlines of the newspapers can still be read, describing oil spills, DNA experiments, and other disasters caused by mankind. The pieces of paper are being moved by small motors, which are attached to the projectors. There are also small ventilators that make the newspaper fragments move. The shadows of these newspapers form three black and white landscapes on the walls of the room. The landscapes are like a trompe l’oeil. In the landscapes all kinds of plants, birds and insects fly around. The landscapes form a paradisiacal garden in the space.